The best gaming decision of my college career was jumping ship to climb aboard the Sony boat. All of my gaming energy was dedicated to the PS2, and their exclusive titles were the icing on the cake. Coming off of my Nintendo fanboy cycle I had gotten used to their mascots, their gameplay polish, their repetitive releases, so the PS2 was full of completely different gaming experiences for me. I found myself cheering for new franchises and wanting to see Sony succeed in building off of some of Nintendo’s standards. They needed a mascot with widespread appeal that would appeal to both kids and gamer’s my age. 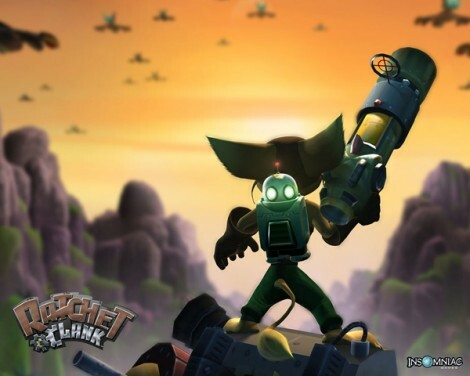 When I first saw Ratchet & Clank I knew it was special. Cuddly mascot, witty writing, fun platforming and shooting mechanics. R&C had it all and has proven over time to be one of Sony’s most steady performers. However, for all my adoration of the series, Sony, and developer, Insomniac Games, personal flaws have made it so I still haven’t come close to finishing Ratchet & Clank. 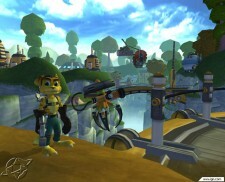 Ratchet & Clank has the complete package for the action adventure fan. Brilliant level design that discourages backtracking across many different worlds that have their own distinct features. These aren’t the cookie cutter lava stage, ice stage, water stage formula either. This is a galaxy full of personality and a story that interconnects your travels much better than any of R&C’s platformer or adventure game cousins. It sits beautifully inbetween genres and offers just about as much explorational freedom as a game can without becoming lost in sandbox gameplay. I came in expecting a platforming romp and having to tolerate an adequate shooting experience. Instead I was greeted with an overabundance of creative weaponry that made shooting enemies and switching between guns exceptionally fun. All of those pieces are enough to elevate Ratchet & Clank to an above average title on any platform, but it’s the standout characters that make this classic so memorable. There are no less than 4 characters that still stick with me almost 9 years later. Of course the namesakes, Ratchet and Clank make for a great heroic and comedic (thanks to Clank) duo. The supporting characters were the real surprise as I found the evil Chairman Drek quite charming as a perfect bad guy, and the corporate superhero, Captain Qwark, worthy of his own franchise. The great voice work and genuinely funny script bring it all together. Unlike some of my other game failures, my inability to finish this game wasn’t from a lack of trying. I put dozens of hours into my Ratchet & Clank experience. My roadblock came in two forms: completionism and a lost memory card. 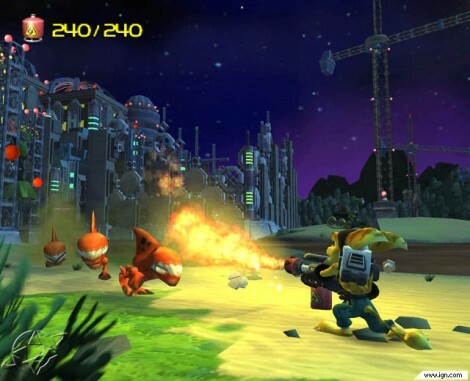 My respect for Ratchet & Clank has been my ultimate undoing. Once I started to explore each world, I had this overwhelming feeling that I was missing out on hidden areas of each stage. Therefore, I tried to comb over each world as thoroughly as possible. My progress slowed to a crawl. Before proceeding to new worlds, I would go back to previous worlds just to ensure I hadn’t missed any part of the map. I become obsessive and had no real way to monitor my progress since I wasn’t really after collectibles. I just wanted to make sure my new weaponry didn’t open up new areas Metroid style. I had a system down at one point, but then tragedy struck. I lost my memory card roughly 2/3 of the way through the game. I had no choice but to start over completely. This major derailment led to some more bad habits. I had started playing the game in spurts as I had lost focus on the title. After restarting the game once, it wasn’t hard for me to restart from scratch again if I had taken a longer than expected break. I wanted to see all of Ratchet & Clank, which in my mind required me to play it a certain way that I wasn’t able to give up on. This stubborness has led to a franchise level problem, as I have purchased multiple Ratchet & Clank titles, but refuse to play any of them until I finish the first game. I know that this isn’t a series that distinctly requires knowledge or experience of earlier titles, they are pretty easy to pick up and play separately. However, I can’t let it go due to some misguided sense of duty for a series I respect. I’m stuck and don’t know the way out. With each new release in the Ratchet & Clank series, my respect for both Insomniac and Sony’s handling of the series has grown, along with my envy grows of truer fans of the franchise that are able to enjoy their new adventures. I wish I was a better fan, and maybe some day I’ll break through and give this great franchise its due. Until then, I’ll continue to overanalyze lesser games until I muster up the courage to just go back and finish what I started. What is Insomniac Up to for E3 11?